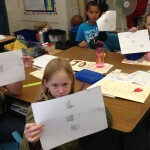 The 5th Graders at Mary Silveira have been very busy! 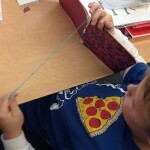 We made imaginary exploration sketchbooks, binding them by sewing. 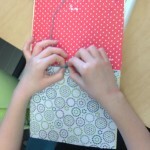 The first thing we did in our new sketchbooks was to make an observation drawing of a key that they found on the beach of their island, studying the object carefully, and drawing larger than life. 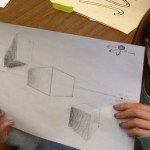 Then we started learning 2-point linear perspective, and practiced our new skill to draw and shade 3-dimensional objects. 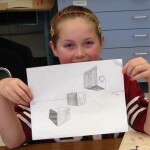 Next week we will imagine what the key opens…and draw it in 2-point perspective! 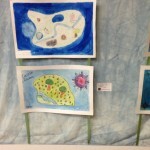 We also had a fabulous art opening at Youth in Arts’ YIA Gallery of our colorful and imaginative island maps, drawn in watercolor, pencil, and pen. 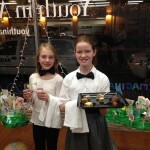 Some of the 5th Graders expertly served canapés, adding a touch of glamour to this fun event. 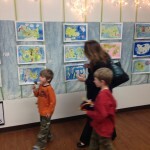 The show is up through January 31.